This is the time of year when most families plan holiday gatherings. But for some area residents, attending a holiday dinner with family simply isn’t possible because they physically can’t leave their homes. On November 14 and 15, the Ayer, Harvard, Shirley, Devens Rotary Club changed that situation for one Shirley couple. The Club built a wheelchair ramp for two elderly residents who had been virtually housebound for several years. “This is wonderful,” the ramp recipient, a 92 year old man, said, “I can’t thank you people enough. Now we can go to our daughter’s for Thanksgiving. It will be the first time in years that we’re able to go.” The man’s wife has severe rheumatoid arthritis and was not able to go up and down the three stairs to her front door. In order to leave her home, she had to be physically carried out by two people. 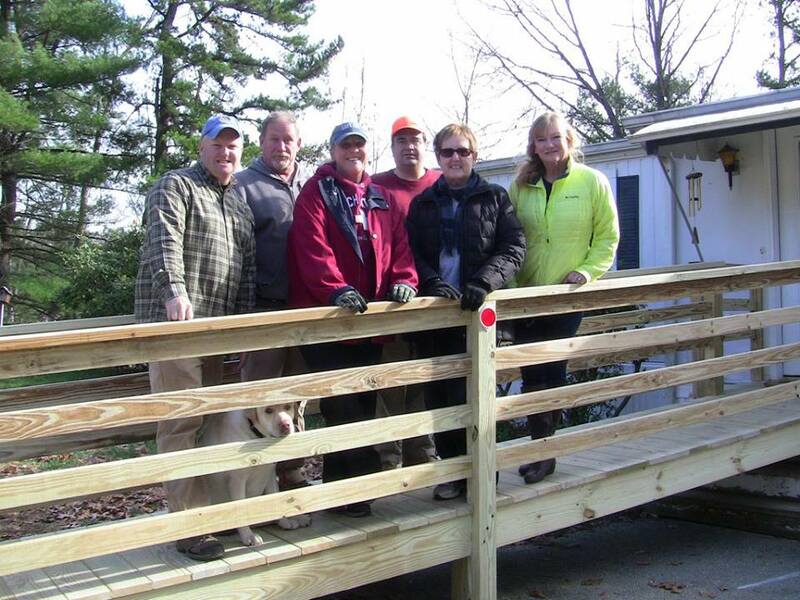 The ramp built last weekend was the second wheelchair ramp built in the area through the Ayer Rotary Club’s Ramps for Freedom project. The project was initiated last year, when a speaker visited the Rotary Club and told of his niece, a young mother of two who was wheelchair bound due to Multiple Sclerosis. The Club donated funds to an organization dedicated to helping people with MS, but realized that there were likely people in this area who were in the same position: prisoners of their own home because of a handicap or illness. The Club decided to do something to help local residents who needed a wheelchair ramp and the Ramps for Freedom project was born. In order to help fund the project, the Club applied for, and was awarded, a District Grant through The Rotary Foundation. Other funds needed for the project were raised through the Rotary Club’s annual Night of Comedy, the Apple Blossom Festival and the Ducky Wucky River Race. The ramp was built using Rotarian and volunteer labor. It is the Club’s goal to keep the project moving forward and to help as many area residents as possible. There is an application process for the need-based ramps. The Club is primarily focusing on building ramps in its footprint of Ayer, Shirley, Harvard and Devens, but will take applications from any resident in the Nashoba Valley area. “This is what Rotary is all about,” said Club President Mike Phelan, “Helping others in our community.” Rotary’s motto is “service above self” and the Ramps for Freedom project demonstrates that value. For more information about the Ramps for Freedom project, or to make a donation to help support the Club’s wheelchair ramp efforts, please contact the club at ayerrotary@gmail.com.